MSEA is a union of nearly 7,000+ classified school employees from over 70 school districts in Minnesota. MSEA members are secretaries, paraprofessionals, food service employees, technicians, custodians, interpreters and bus drivers. What does MSEA do for school employees? MSEA provides services and resources for classified employee groups in negotiating contracts, processing grievances and arbitrations, leadership training and legislative lobbying and monitoring. MSEA has a well-trained, experienced, full-time staff to provide the highest standard of service possible to our members. What makes MSEA different from other unions? MSEA is a democracy. The members truly direct the union. 95% of our budget is spent providing negotiation and representation services to members. MSEA represents only classified public school employees, allowing us to devote our full attention to all aspects affecting part-time and full-time public school employees. Who determines MSEA's positions, objectives, and actions? MSEA is truly a democratic organization. 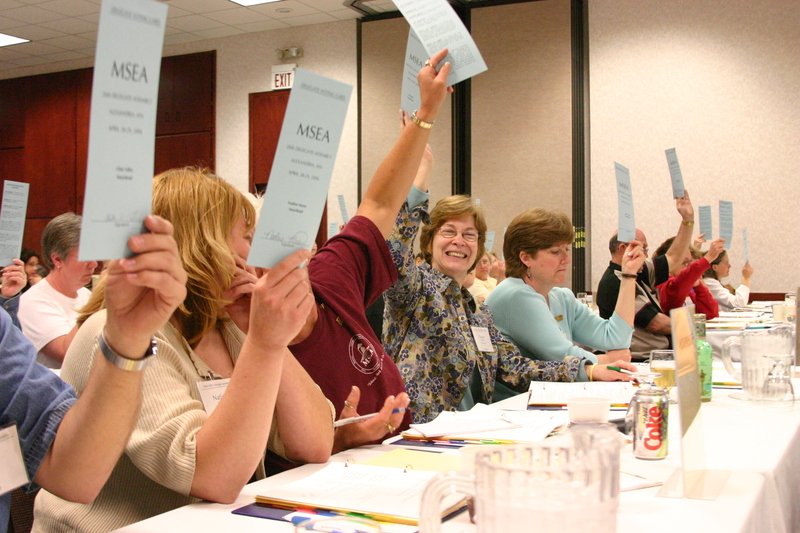 Each year, representatives from all of MSEA’s bargaining units are invited to attend MSEA’s Delegate Assembly, where all MSEA governing policies are passed. MSEA’s Board of Directors are members elected by members at the Assembly and meet monthly to carry out the policies of the Delegates. What rights do employees gain with a union? Because your unit has elected MSEA as their Exclusive Representative (union), your employer must by Minnesota state law (Public Employees Labor Relations Act) negotiate a contract with you. This contract is binding for the period specified in the contract and can be changed only by negotiations between the union and the district. Without being recognized as an Exclusive Representative (union), your employer only needs to pay you minimum wage with time and a half after 40 hours per week. Even if your employer did give you a contract, they could change it at any time. The members of your unit determine what issues to address in negotiations. Experienced field staff are available to assist in the negotiation process as determined by unit. MSEA also enforces the contract, helps members in processing grievances and takes those grievances to arbitration when necessary. What benefits can employees get through unionizing? Members voting on a resolution at the annual MSEA Delegate Assembly.